i would like to present my game. It’s a point and click adventure game about Jesus and his story after the crucifixion. Im still working on it, i would like to release it this year but I dont know exactly what month. You can find some screenshots and more details on the website. If your are interested, please follow the game on Twitter or Facebook to see the news. Hi Amir, please tell us much more about your game. So you’re saying there will be ‘black humour’ in the game you are creating about the days of the resurrection of the Lord? Yes, Yes, I’m downstairs, in the morgue. Thank you for your questions guys. Much more about the game? Hmmmm it’s an adventure game. Is that enough? there is a short description on the website, to that i can tell you a few things and i’ll answer DrHermann at the same time. i am an Ex-christian, i was very religious and i still find the religions and the different gods interesting and also that’s why I chose this topic. Believe me, the Secrets of Jesus is not a game just for unbelievers but also for christians and jews. I tried to make the believers and unbelievers satisfied. In the game the black humor is not about death and violence, it’s somthing like black humor i dont know how i can explain it. Do you know the movie Monty Python’s Life of Brian? It’s something like that. i will add here the description from the website, becoz i think many dont visit the website. The Secrets of Jesus is a point and click adventure game which tells the story of Jesus (Christ) after the crucifixion. You play Jesus, who is sought again by the Romans. Solve puzzles, reveal secrets and help him to find a missing person and escape the Romans. Immerse yourself in the atmosphere of the first century. Get to know many quotes and sayings from the Bible. Meet biblical people, experience a real adventure with a lot of black humour and you decide at the end whether it’s a real story or fake story. Any “interactions” with Mary Magdalene? Mary Magdalene plays a big role in the game. 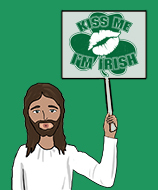 Why is Jesus standing in front of a St Patrick’s saltire in your avatar? Has he become Irish? I mean, if that’s the real “secret of Jesus” then you’ve pretty much spoilered the game right there. It’s not a spoiler. I didnt mean that when I painted it. It’s just a red background behind a cross. Poking fun of Christianity was already overdone by the time I was cloned from the DNA of the late Chief Judge Fargo. If you want to stick out from your class, young cadet, dare also face no-go zones such as Islam or the buried Haavara Agreement. Such bravery will get you a sarcophagus in the Hall of Heroes. Hi mr Joe Thank u for ur opinion. No matter how the poking fun of Christianity is overdone in my game, i think the game will be played more by Christians than atheists or unbelievers. Thank God, I am atheist, but I still would play your game. Will your game The Secrets of Jesus be playable for Zoroastrians? Kindest regards, may God guide you always. Spoiler alert: Judas must kiss Jesus in order to get him arrested at Gethsemane.